Indian names: kupanti, budda, budamma (Andhra Pradesh); ban tipariya (Bengal); parpoti, popti (Gujrat); rasbhary (Himachal Pradesh); tulati pati (Hindi); gudde hannu (Karnataka); njodi njotta (Kerala); chirboti, dhan mori (Maharashtra); tholtakalli (Tamilnadu). 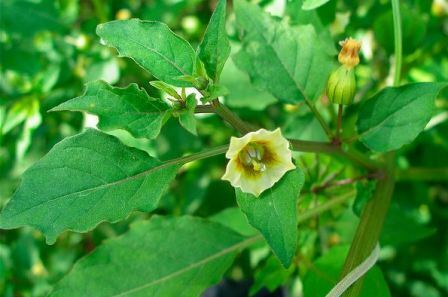 Wild Cape gooseberry is commonly found on the bunds of the fields, wastelands, around the houses, on roadsides, etc., where the soil is porous and rich in organic matter. 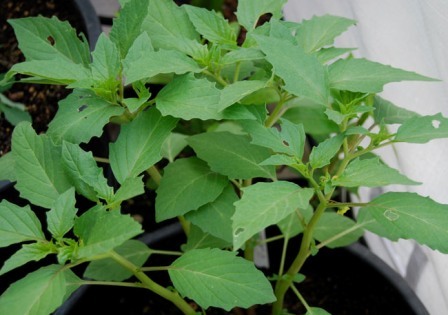 It is an annual herbaceous plant having a very delicate stem and leaves. It is found growing in the sub-Himalayas up to altitudes of 1,650 metres. It is also reported to grow in Afghanistan, Baluchistan, tropical Africa, Australia. Ceylon, etc. A small, delicate, erect, annual, pubescent herb, 1.5 metres tall; internodal length, 8.2 cm; more or less the whole plant is pubescent. Leaves, petiolate (4.1 cm long), ovate to cordate, pubescent, delicate, exstipulate, acuminate, having reticulate palmate venation and undulate margins; dorsal surface of the leaves, dark green and the ventral surface, light green; 9.7 cm long and 8.1 cm broad. Flowers, pedicellate having 1.2 cm long pedicel, hermaphrodite, complete, solitary, small companulate, 1.2 to 1.4 cm in diameter; calyx; gamosepalous, 5-toothed, actinomorphic, green, persistent, downy; corolla, gamopetalous with five petals, the petal cup, 1.1 to 1.3 cm long, yellow, having five black spots on yellow ground in the middle of the corolla cup; stamens, five, epipetalous, 6 to 7 mm long, having a black filament and greenish-yellow anther lobes; style, black, 9 min long, having a yellowish stigma at the top and a yellowish round ovary at the base. Fruit, a berry, enclosed within the enlarged, 10-ribbed, reticulately veined calyx, which is 4.1 cm long and 2.5 cm broad; berries, stalked (stalk, 2.2 cm long), almost round having a pinhead-sized depression at the end; diameter, 1.4 to 1.6 cm; weight, 2.15 g; volume, 1.32 ml; fully mature fruits primrose yellow 601/2 at full maturity. 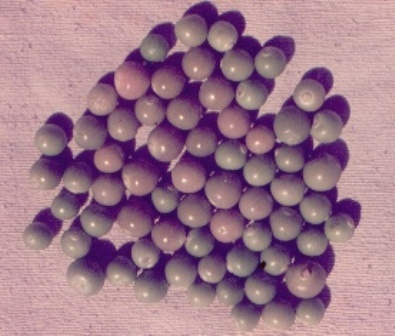 Seeds, globose, Dresden yellow 64/3; weight and volume of l00 seeds, 113 mg and 197 microlitres respectively. The flowers appear in acropetal succession, i.e. the lower flowers appear and form fruits earlier than the upper ones, which emerge as well as set fruit later. In this way, the flowering and fruiting season of this plant starts from March-April and continues up to the end of November. The fruiting starts from the middle of August and continues till the end of November. The peak fruiting season in the Solan area, however, is October. The average yield from a plant covering 2.5 square metres was found to be 545 g.
The fruit is juicy, containing 61.4 per cent extractable juice and 76.7 per cent moisture. The total soluble solids content of the juice is 12.5 per cent. The acidity of the juice is 1.84 per cent. The fruits contain 5.97 per cent total sugars, 3 per cent reducing sugars, 2.81 per cent non-reducing sugars, 0.64 per cent tannins and 0.52 percent pectin. They contain a good amount of vitamin C which is 24.45 mg per 100 ml of juice. The mineral content of the fruit, as represented by its ash, is 1.216 per cent. The protein content of the fruit is 2.75 per cent. The content of some of the important minerals of the fruits, viz. phosphorus, potassium, calcium, magnesium and iron is 0.108. 0.613, 0.024, 0.056 and 0.006 per cent respectively. The plants of Physalis minima Linn. are reported to in Ayurveda to be bitter, appetizing, tonic, diuretic, laxative, useful in inflammations, enlargement of the spleen and abdominal troubles. The fruit is considered to be a tonic, diuretic and purgative in the Punjab. The mundas (a tribe) of Chhota Nagpur mix the juice of the leaves with water and mustard oil and use it as a remedy against earache. The fruits are juicy, mildly astringent and sweet with a pleasant blend of acid. The overall quality of the fruit is good. The fruits are covered by the persistent calyx which protects them from external injury. They are eaten and liked by all. They are juicy and, as is evident from their chemical composition, they are a good source of vitamin C. The raw fruit can also be used as a vegetable. 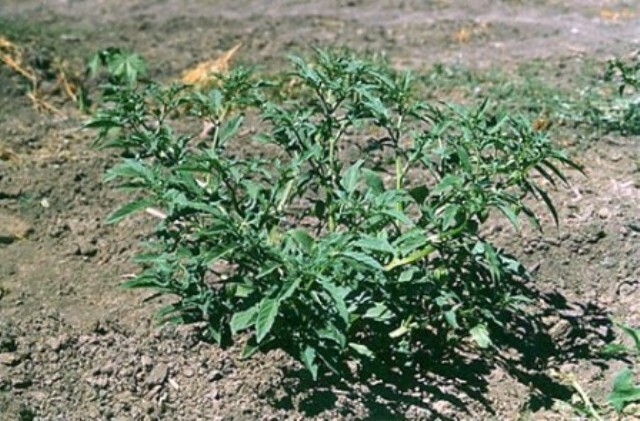 This plant is highly resistant to insect pests and diseases. Its cultivation should be developed and the techniques for making squash and jam from its fruits should be standardized.